FLORENCE, May 20 2013 (IPS) - As the global agricultural sector is faced with ever-greater challenges, the question of how to reform and improve the sector is a controversial and difficult one. So Terra Futura, a three-day exhibition and conference on agricultural good practises held annually in Florence, brought the debate back to its roots: seeds. Terra Futura (Future Earth) has been held for ten years as a network for institutions, associations and civil society, which gather in Florence and exchange ideas and experiences for alternative and sustainable environmental, economical and social development. Vandana Shiva, a scientist and environmental activist, presented a series of initiatives to defend the survival of local and traditional seeds. The initiatives connected land, food sovereignty, biodiversity and environment. Shiva presented the “law of the seed”, a campaign targeting intellectual property and patents claimed by agribusiness giants. The project aims to reaffirm the centrality of biological and natural rules against the logic of the agribusiness sector, which relies on genetically modified organisms (GMOs), monocultures and intensive agriculture. “What we intend to achieve is to overturn the logic behind the criminalisation of ordinary seeds and protect the right of farmers to breed their own seeds,” Shiva told IPS. Yet the current trend seems to be running in the opposite direction, with multinational companies trying to impose the use of patented, genetically modified seeds, with disastrous consequences for local farmers, especially in the third world. “We have already seen what the entry of Monsanto [a multinational company in agricultural biotechnology and leader of genetically engineered seeds], has done to the cotton sector in India,” Shiva explained. She added that “95 percent of cotton seed is currently owned and controlled by Monsanto, causing farmers to get into deep dept to pay the royalties”. According to Beppe Croce, the head of the non-food agriculture section of Legambiente, Italy’s biggest environmental organisation, Europe has managed so far to keep the cultivation of GMOs outside its borders. “From a legislative point of view, the local production is protected,” he said. According to Fabris, this policy is undermining the production system of countries like Italy, which “have to face the competition of agroindustrial systems outside Europe that are obviously cheaper than ours”. Under such circumstances, the odds of GMO cultivation not entering Europe seem all but impossible. But the lobbying efforts of agribusiness companies are finding new ways of breaking through. On May 6, the European Commission drafted legislation that prevents farmers from producing their own seeds. But citizens are rediscovering the value of good food, as demonstrated by phenomena and movements such as Slow Food, solidarity-based purchasing groups, and urban gardens. After a half-century of industry control, “people are experimenting [with] new solutions to have more control [over] what they eat,” Shiva said. Another initiative, “Seeds of Future, Gardens of Hope”, is moving in the same direction. It is being promoted by Shiva’s non-profit organisation, Navdanya International. 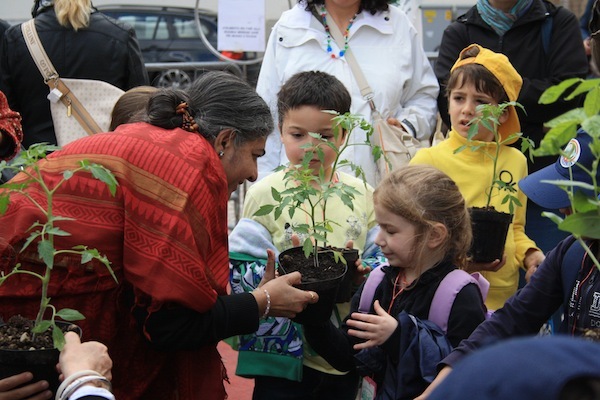 Through it, children in Florence’s primary schools are given plants of local species to grow in their gardens. “We are not just talking about education. We are talking about them being the custodian,” Shiva told IPS.